I’ll admit, I did more skimming on this one than usual as it is meant to be a vision to practice manual and I’m not actually working in a school right now. I’ve also been part of a research group studying personalized learning schools for the past year, which means I’ve heard and seen a lot of these stories. I think for teachers and leaders in traditional school settings, however, this could be a powerful book for reimagining what learning can look like. The authors do a nice job of pairing vignettes from multiple perspectives – students, teachers, parents, leaders – with specifics about support systems or assumptions that we make. One of the most compelling and frustrating aspects of educational change is that “we all know these things. Yet, our behaviors do not support them.” (p.82) When you finally see the disconnect between the way we do school and the way we choose to do the rest of our lives, from shopping to listening to music to hanging out with friends, you can’t stop seeing it. Some people might challenge that school shouldn’t be the same as real life – it’s “work” after all, whatever that means. I was recently reading over an interview with one of the teachers in our study and she said that her former colleagues keep commenting how she looks so much more relaxed and happy this year. It seems we are all perpetuating a system that stresses us out (kids, parents, teachers, and leaders included) just because that’s the way it is and always has been? So much of what we do – one test for all kids, writing papers and getting feedback a week later, sitting in lectures – isn’t actually the best way to do it. If our purpose is to facilitate learning, if this is the function of schools, then the form of our schools needs to follow this (p.78). Capitalizing on the technology and resources that are already at our disposal means that it’s possible. Learner outcomes. “The key to this type of flexibility lies in writing learner outcomes that are demonstrations of learning. That is, outcomes that are clear about what the learner must do to demonstrate mastery of that learning outcome. Traditional curriculum tends to be about ‘topics, about what the course will cover.” (p.125) I’m curious that competency based learning seems to be a fundamental here. I wonder if you were trying to transition a school system, if you could begin by having teachers work on CBL for their courses for a few years and eventually turn the kids loose to meeting them in a more personalized way, rather than opening up the whole thing at once. Chapter 9 outlines the seven critical elements to be ready for rollout. This includes some honest lines about how you approach a school staff to say that “school systems are not in the employment business, they are in the student learning business,” and that all staff should be given the option to evaluate whether they want to be on board, “should I stay or should I go.” (p.156) There are important philosophical beliefs that everyone in a school will not agree on – purpose of education and degree of control. These are continuums, but it may be important to access these beliefs before beginning a “conversion” to MCL. Everyone has to implement the new vision, not just leadership, so the message and direction needs to be clear and open, that “the new vision is not optional,” (p.155) and the authors point out that “people need to see both the big picture and their role in achieving that picture” (p.114). I can see why it is much easier to start from scratch with people who opt in (like creating a new charter school) rather than trying to “convert” a school already in existence. I like the idea of the “weight bearing walls” metaphor: what is it that’s holding up the roof that we can’t remove without it all crashing down? If we replace one, we need to do it one at a time. These WBWs can also be what prevents us from changing because we’re too worried about the roof. They outline an activity: look at your WBWS – grade levels, students assigned to classrooms, class periods/bell schedules, courses/curriculum, textbooks, paper and pencil, ABC grading system, report cards, learning happens in schools, and nine-month school year – then ask these questions for each – what it does for us, what it stops us from doing, today’s power technology, and who is doing it now. This accesses what we already believe and value about the way things are, contrasts it with what is frustrating, and what tools there are to solve it. One small comment about the written style of the book: it terrible to read. I realize it is meant to be causal or accessible, but I felt like it came across more as belittling, like we (lowly teachers) need need call out boxes and summary points in order to understand it. There were also a lot of “Just sayin'” colloquialisms sprinkled through that were unnecessary. And a weird series of digs at soccer moms: “Lest this discussion of organizational structure seems too complicated or too lofty, we would like to point out that soccer moms, with all their responsibilities and activities, are very skilled at accomplishing the five points listed above,” (p.134) like they wouldn’t understand it the way it’s written because soccer moms would get confused by such technical terminology. And then another, “FedEx and UPS are another good example of a complex infrastructure that seems to work smoothly…. A bit more complex than a soccer mom planning her day, but not that different at their ‘logistical planning’ core.” (p.145) It just struck me as one of those offhanded, unreflective ways that we make assumptions about people. And in one of the vignettes, the dad works at a high-tech firm and the mom is part-time in the school district. I guess I’m sensitive to this sort of stereotyping because people don’t see it and it perpetuates not thinking about it. Would I recommend this book to you? Yes and no. 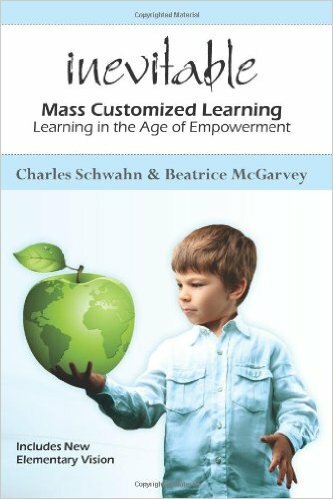 I do think personalized or mass customized is the future of learning in schools, and this book lays out a compelling argument for it and how to implement it. It’s a little too watered down for my taste – I could have used a bit more theoretical or philosophical meat in there – but I think it would work well as a school wide read for educators and parents to start thinking differently about schools vs. learning.